This entry was posted in blogging and tagged browned butter, challenge, chocolate chip cookies, cookies, food, gluten free, pinitdoit, pinterest. Bookmark the permalink. They do look big but it doesn’t matter what they look like as long as they taste good. Good luck with the challenge! Thanks! And yeah, the size doesn’t really matter. How do they taste? Melt in your mouth chewy or hard and crunchy? They’re definitely not hard. There was a bit of crunch last night, but they’re nice and chewy now. Why not sure? 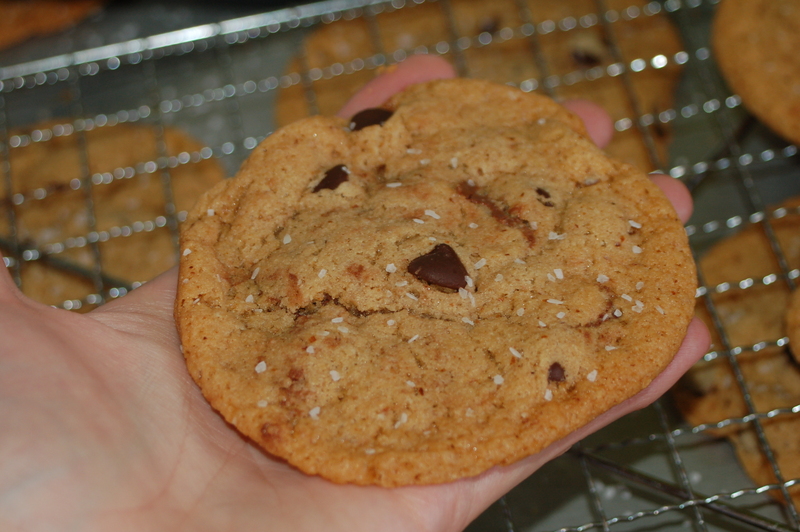 Even without the nutella, they’re super yummy and not your standard cookie. The browned butter makes a difference, as does the unusually high ratio of brown sugar to white sugar. Sounds like a lot of effort… if you say its worth it then perhaps I’ll add it to my list. A lot of the work disappears if you don’t do the Nutella (pipe, freeze, wrap cookie dough around rapidly thawing dabs of Nutella …) That way, browning the butter is really the only different thing. Leave out the Nutella and the only thing out of the ordinary is browning/cooling the butter, which is totally worth it for the flavor. The recipe also says to chill the dough, but I have a feeling that’s only to make it easier to insert the Nutella. Also, it’s apparently common knowledge that letting your cookie dough chill overnight, or longer, gives you better cookies. If you have any dough left after that period of time that you haven’t snitched. I DO want to try the browned butter thing, though. I also didn’t add quite as many chocolate chips (about 1 1/4 cups, all dark, instead of 1 3/4). My plans for the next batch: Cool the butter all the way to room temp so it creams more nicely with the sugars, up the #gf flour by 1/4 cup to see if we can get them a little softer and leave the salt out of the batter. They’re just a little too salty on the back end after adding it to the top too. But, really, with the higher amount of brown to white sugar, lots of vanilla and browned butter, these might be the best tasting chocolate chip cookie I’ve EVER had. 3. I shouldn't mention this, but I don't love nutella. Just give me plain chocolate chip. 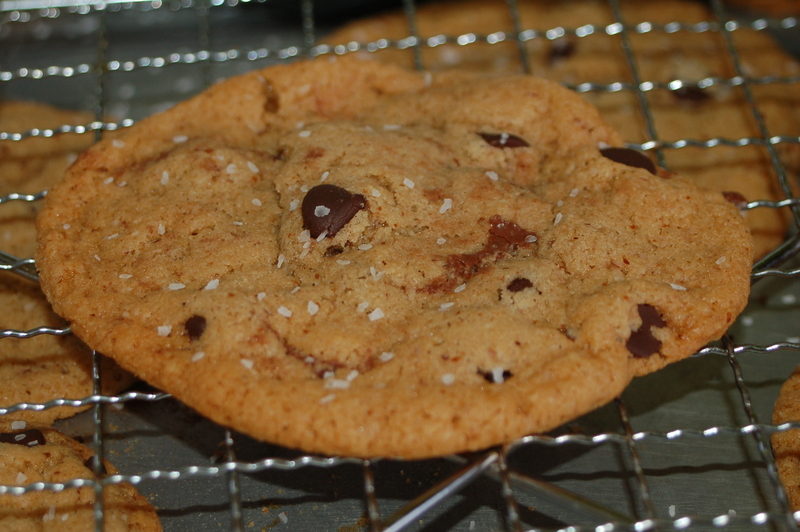 ALTHOUGH I have been hearing great things about browned butter, salted cookies. As I think I made clear � moreso in the comments than in the post � the nutella in these cookies actually doesn’t help. I’m actually not that fond of Nutella either, but the cookies look good – I like that they’re giant. They look like they’re softly chewy and chocolately. Now I need to find some pins for Pin It Do It! Ack! I missed that another one was going on. I only got 2 things done the last challenge. Glad your cookies were good, even if you didn’t think the Nutella was necessary.